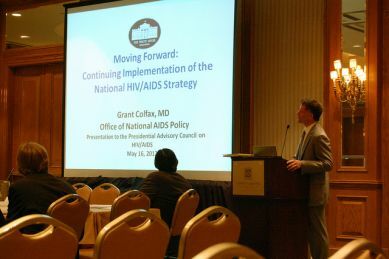 (Photo Credit: AIDS.gov)A presenter speaks at a meeting of the Presidential Advisory Council on HIV/AIDS on May 16, 2012. The United Church of Christ has backed a U.S. government advisory panel's support for "comprehensive sexuality education" for youths. Two UCC officials issued a statement on Friday supporting a resolution passed during a May 16-17 meeting of the Presidential Advisory Council on HIV/AIDS. Ann Hanson, the UCC's minister for sexuality education and justice, and the Rev. Michael Schuenemeyer, executive for health and wholeness advocacy said, citing a Congressionally mandated study, that abstinence-only programs "oftentimes withhold information about HIV, are medically inaccurate, promote gender stereotypes and are not sensitive to sexually active and LGBT youth." The UCC, according to a report by UCC News, has previously supported a curriculum designed with the Unitarian Universalist Association that "celebrates the belief that all people are created in the image of God, and that children, youth and adults need to receive medically-accurate and age appropriate education in order to make choices that affirm and save lives."